My 5-year-old daughter will be starting Kindergarten in September. Although she has always loved listening to me read to her, she is slowly becoming more independent with her books. I have found that she has really taken a liking to reading books on the iPad. There is something about the interaction and animation that peaks her interest and keeps her more engaged than paper books. Nonetheless, when Ruckus Reader offered me the chance to review their app, I could not wait to check it out with her. 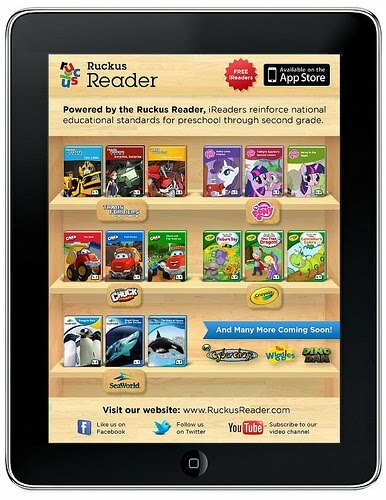 Ruckus Reader is loaded with digital storybooks that are geared to the 4-7 year old age group. Stocked with books from great names like My Little Pony, Transformers, Crayola, Chuck and Friends, Dino Dan and Sea World, choosing from great titles filled with familiar character favorites is easy. Stories are broken into levels 1, 2 and 3, making it easier to choose books that are best for your child’s personal level. This app is designed to not only assist your child with their reading skills, but it also keeps parents up to date about your child’s progress, reading levels and reading times by sending weekly reading progress reports via email. Perfect for preschoolers, Ruckus Reader is a fun and innovative way to engage your child while helping them to build a love for reading and strengthening their skills along the way. Who knew summer reading could be this fun? As we have been working our way through the series of books, I have found that the stories are quite unique from one another. They offer various activities including creativity and coloring, word games and create-your-own story using simple choices provided by the app. With the addition of these activities, reading has become more like a game for my daughter, which has made her want to “play” longer with the stories and she is less likely to tune out as quickly. I must note that in several of the stories we read (such as the My Little Pony series), some of the names were more difficult than I would have expected for a young child. I would love to see Ruckus Reader come out with some “site” word or pre reader level books that would be even more beneficial to my new little reader. Nonetheless, with a little help, the current books have still been a huge hit with my daughter and I know her skills will continue to get better as she continues to listen and read. The portability aspect is one of my favorite perks of this program. When we have a doctor’s appointment, long car ride or are heading away on vacation, bringing the iPad beats lugging a pile of books, and my daughter enjoys staying occupued with her virtual storybooks. Books range from free to a 6 month subscription for $24.99, which in my opinion is fair, considering the price you would pay for the number of books included in the iLibrary. This app is a fun (and portable) way to help your child get more excited about reading. Would you like to give it a try with your child? Ruckus Reader is generously offering to give away one six month subscription and two one month subscriptions to lucky Delco Deal Diva readers. Simply enter via the easy Rafflecopter form below for one of three chances to win. Good Luck! Disclosure: I was given a free subscription to Ruckus Reader to facilitate my review. All opinions, as always, are my own. I think would love this! They have books with his favorite characters. I would win this for my daughter since she LOVES being read to and she wants me to read to her all day long. I have a four year old who loves learning about reading.